Royal Birkdale - Branden Grace made history on Saturday when he became the first man to shoot a round of 62 in a major in the third round of the British Open at Royal Birkdale, but he admitted he had been unaware of the landmark. There had been 31 rounds of 63 in the previous 441 major championships, with 10 coming in the British Open including Phil Mickelson and Henrik Stenson last year at Troon, but never a 62. The South African's eight-under-par round, featuring eight birdies and no dropped shots, saw him rocket up the leaderboard to four under par overall. Grace, who narrowly made the cut as he sat at four over par at the tournament's halfway stage, also broke Jodie Mudd's course record of 63, set in the final round of the Open in 1991. But remarkably Grace insisted he had no idea of what he was about to achieve as he was heading down the 18th. "I honestly didn't. You know, I was just so in the zone of playing, hole after hole," he said at the end of his round. "I knew I was obviously playing really well, and making the turn in five-under was pretty special. And I thought if I could make a couple more on the back nine, then it's going to be a great score. "I had no idea that 62 was the lowest ever." Grace had five birdies on the front nine to go out in just 29 before three more coming home, at the short 14th and back-to-back at 16 and 17. He risked missing out on history when he sent his approach to the 18th long, but a fine putt from the very back of the green allowed him to rescue par. That was when his caddie Zack Rasego - who carried the bag for Louis Oosthuizen when he won the Claret Jug at St Andrews in 2010 - broke the news to him that he had made history. Grace added: "My whole thing on the 18th was trying just not to make bogey. I hit a great wedge in there, just caught a fly, a little bit of a jumper and made it tough for myself. "But obviously I knocked in the two-footer or three-footer. And Zack came up and said, 'You're in the history books.' And I was like, 'What are you talking about?' So obviously now it makes the day even sweeter." 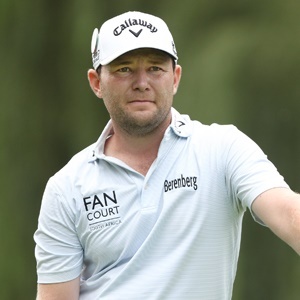 The 29-year-old from Pretoria, ranked 35th in the world, has previously had four top-five finishes at majors, including a third place at the PGA Championship in 2015. He equalled the record for the lowest ever round on the European Tour when he shot a 12-under-par 60 at Kingsbarns in his 2012 victory at the Alfred Dunhill Links Championship.